This week I started two new projects. The first is A Better Bucket hat, using some of my handspun yarn. I wear hats all the time, especially in cold weather — more are better! 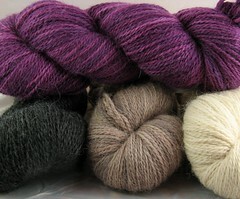 I also bought yarn for a KAL starting Feb 1 …. and already cast on. It’s ok, don’t worry — I’m not in trouble. The designer, Nancy Whitman, assures us that the “Feb 1st” date is only approximate. 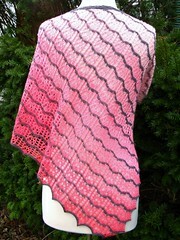 Her Eden Prairie shawl is so interesting and graphic. Worked entirely in garter stitch, in sections from live and picked-up stitches, this is a relatively “mindless” project much of the time, punctuated by occasional color changes. 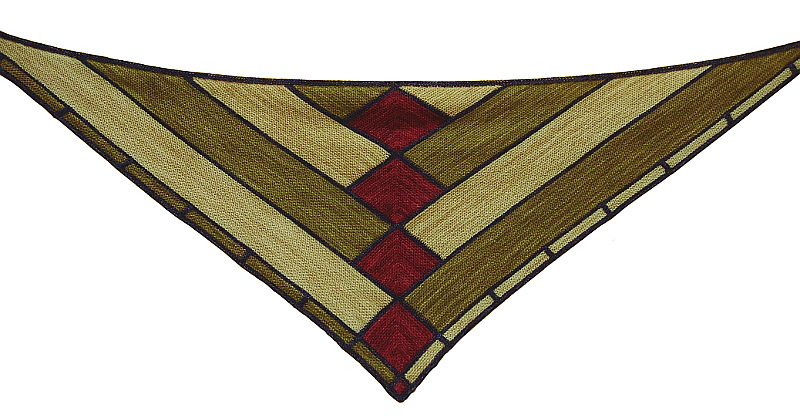 Charcoal for the border color, Pansy for the center squares, Wren and Oatmeal for the stripes. I’m a bit late in seeing this, but thanks for spreading the word about Eden Prairie! You’re welcome! I just finished the third tier at my knit night :).